A personal whistle may seem like a fairly old-fashioned thing to bring to an event like CES. But PapaGo’s new Geko smart whistle is anything but old-fashioned. Todd met with Paulina from PapaGo who listed out all of the features of this award-winning product. 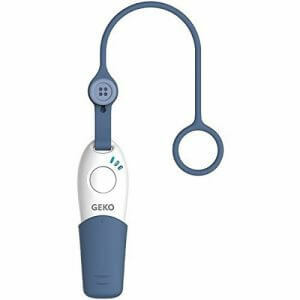 The Geko smart whistle connects to a user’s mobile device via Bluetooth. If the user triggers the whistle, either by blowing thru it like a standard whistle, or pressing a button built into the whistle, the whistle sends a signal to the user’s phone, which in turn contacts three different people by text, e-mail, and telephone (phone calls available on Android devices only). These messages are predefined to let the recipients know that the sender is in trouble, along with a map of the sender’s location. When the whistle is triggered a second time, it sends an “all clear” message to let recipients know that the user is now safe. The PapaGo Geko smart whistle is already available for purchase for $49.99. The whistle will send up to 30 messages for free, but users can purchase more messages if needed.